August 12, 2018 — Hey! It’s August 12. That means we should talk about Halloween. Right? RIIIIIIIIIIIIIIIIGHT???? More specifically, let’s talk about the 2018 OTIS Halloween Season. This year marks the ninth year of whatever that is. For new readers, we celebrate Halloween as a season instead of a day. And that season starts in September. During that season, the Jekyll of OTIS becomes the Hyde of a Halloween blog. That means daily content, content, content, content, content (to bastardize Garfield on his Halloween adventure). Not all of it oddity and travel-based, though, as is my usual focus. Anything that you can shove a jack-o-lantern on top of is fair game. That can be movies and decorations and activities and random thoughts and a much wider range of experiences. Anything goes as long as it goes well with Tim Curry’s number on The Worst Witch. Here, take a stroll through the OTIS Halloween Season archives. That’s better than my attempt at an explanation. And now that I have explained it, this Halloween season, we’re going to do things a little differently. I discuss it all in the video below. But you can skip that and read it in bullet point form lower down if you want avoid all my stammers and beard yanks and dead stares and harsh light and dusty attics. Please buy Death and Douglas this year for your Halloween reading. It’s exactly why I wrote it and last year it missed debuting during the season because of internal publisher complications. Actually, buy any/all my books. They’re all Halloweenable. But especially Death and Douglas and A Season with the Witch. Those average the word “Halloween” three times on every page. This year, instead of a series of standalone articles, I’m going to focus on the Halloween Die-ary. I want to chronicle a season, not really capitalize on one. That said, there will still be some standalone articles because I enjoy writing those on cool nights with pumpkin spice-scented candles burning and the soundtrack from The Lost Boys playing. My third child will be born during this season, so that’s going to cause some excitement and at least one post from a hospital that I hope is decorated like the one in Halloween 2. Because I’m focusing on the Die-ary this year, we’ll start on September 1, two weeks earlier than usual, so I can chronicle the runway and not just the launch. Follow me on the socials for some more immediate Halloweenery: I’m on Facebook and Twitter. 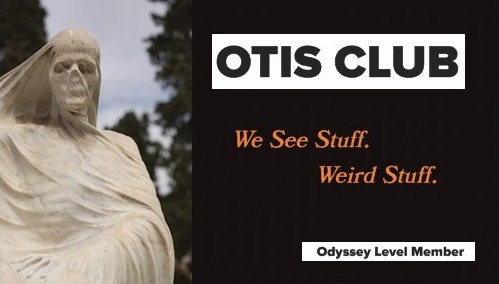 Join the OTIS Club for even more Halloween Season content. Cancel when your thoughts start going all sugar plum or stick around for when the OTIS Club goes all Santa.